Since the 1980s, Quebeckers have become more and more amateurs, connoisseurs and wine lovers. Some make even wine at home in the basement. Once beer was preponderant and it continues to hold a strong presence when going to sports bars and games but around a good table in Quebec wine reigns. Many Quebeckers want a wine cellar at home and it is for this reason that our group of contractors offers the basement renovation for a wine cellar. The Basement Renovation Montreal Group targets wine lovers who want a space to store and even produce wine bottles at home. 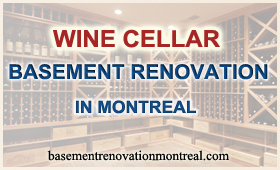 Mr. Daniel Dargis, Engineer, and general contractor in renovation and new construction is chairman of the Basement Renovation Montreal Group and he knows a little about wine cellars. He is an amateur and makes himself wine in the family as do the Italians of Montreal, with real grapes. Wine needs to be kept in a place where temperature and humidity are controlled to retain its quality and the basement is often an ideal place because it is less susceptible to temperature changes during the seasons in Quebec. Depending on requirements often just a small space in a corner of the basement is enough to turn it into a beautiful cellar in a renovation project. A few well-insulated walls, a door, a humidity controller, good ventilation and wine racks will be enough to transform this wasted space in the basement into a charming and useful cellar. For people who want a more elaborate wine cellar we offer a team comprising: a designer, masons, cabinetmakers and general contractors who can transform part of your basement into a real cellar worthy of the great masters of wine.